The TREES-3 project of the Joint Research Centre of the European Commission aimed at assessing change of the world’s tropical forest cover, for the periods 1990–2000 and 2000–2010. Based on a systematic sampling approach, multi-temporal satellite imagery were analysed for a large number of sample sites in the tropics (4016 sample units of 10x10 km2 size). Processing: Imagery of Landsat satellites (TM and ETM+ sensors) at spatial resolution of 30m was pre-processed as input to automated procedures of image segmentation (eCognition software), digital classification and change detection. Visual assessments and quality control/validation were performed using dedicated image analysis tools and involving forestry experts from tropical countries. Changes in forest area were mapped and change statistics and matrices established. The results also served as input to the Remote Sensing Survey of the FAO Global Forest Resources Assessment programme (FRA). Estimates for global and continental carbon emissions due to forest cover changes in the tropics derived from TREES-3 assessment. 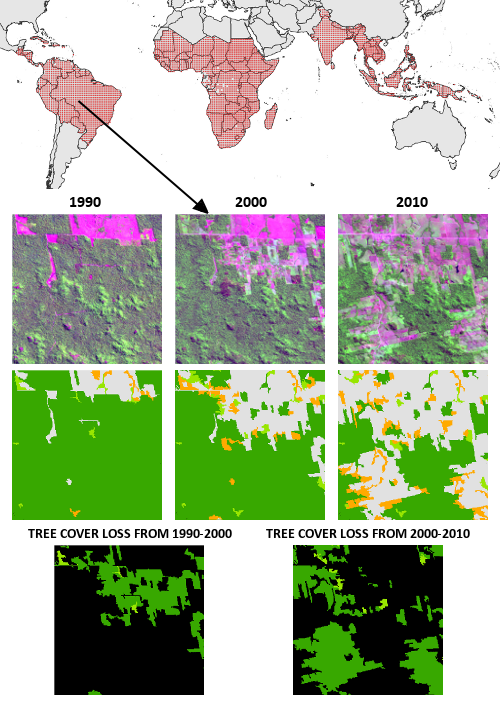 Continental charts showing (from left to right): (a) area of forest cover (green) and other wooded land (orange) for year 2010 in million ha, (b) annual gross loss of forest cover for 1990s (pink) and 2000s (red) in million ha yr-1 and (c) annual gross loss of carbon losses from changes in forest cover and other wooded land for 1990s (light blue) and 2000s (dark blue) with removals from forest regrowth (yellow) in million tC yr-1. Ranges represent statistical standard error for (a) and (b) and maximum–minimum estimates for(c). Achard F., Beuchle R., Mayaux P., Stibig H.-J., Bodart C., Brink A., Carboni S., Desclée B., Donnay F., Eva H.D., Lupi A., Raši R., Seliger R., Simonetti D.
Mayaux P., Pekel J.-F., Desclée B., Donnay F., Lupi A., Achard F., Clerici M., Bodart C., Nasi R., Belward A.
Eva H.D., Achard F., Beuchle R., De Miranda E., Carboni S., Seliger R., Vollmar M., Holler W., Oshiro O., Barrena V., Gallego J.